Read by approximately 4000 people weekly, 1000 copies of our publication can be found in over 80 high traffic areas where potential customers are eating lunch, taking a coffee break, waiting for services, and more. Advertisements can be modified weekly to update specials, sales and up-coming events, etc. at no extra charge. To ensure that the proper changes are made in time for the latest weekly issue, we recommend current advertisers submit new information no later than Monday at 5 pm. New advertisers are asked to submit all information no later than Friday of the week before the new ad is to be published. One to two new customers attracted to your business will pay for the weekly ad. Take 5 packages are comparable to or less expensive than other advertising options in the area. It’s easy to get noticed with our 28 standard, 4 oversized and 4 specialty ads per week. You just have to choose your size and we’ll do the rest. Standard advertisements are 3″ x 2″ in size and are rotated on a weekly basis so all businesses get equal exposure in terms of ad location. A total of twenty four standard advertising spaces are spread over the left and right columns of both pages. Save again with an exclusive one-week run or with smaller-sized ad placements. This new addition to the paper allows businesses to advertise time sensitive events for a week or two at a time without having to make a long term commitment. Each ad in our “What’s on the Go?” section consists of 3 lines of text suitable to advertise the business name, brief details about their upcoming events and their contact information. Econo ads are designed to allow businesses to advertise their business name, location and phone number only. A 1 month term is required. These are displayed in addition to the “What’s On The Go?” spaces. What area does Take 5 cover? Clarenville, Shoal Harbour, Milton, Lethbridge, Bloomfield, Musgravetown. How many locations display Take 5? Take 5 is delivered to 90+ locations and it is seen by 4000+ people each week. How often do you print and how many copies? 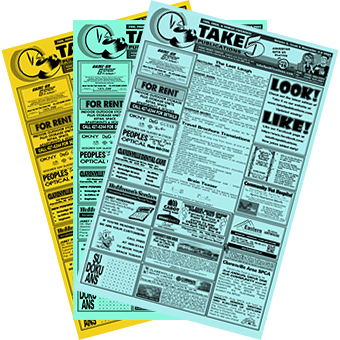 1000 copies of Take 5 are printed weekly. Can Take 5 design an ad for my business? Yes! Provide us with the details that you would like in the ad and a logo, if you have one. We will put together 3 ad designs for you to choose from and return them to you for your approval. You can make any required changes prior to printing. How far in advance do you need information for a new ad? All information for new ads must be received by Friday 5 pm in order to appear in the following week’s edition. This allows sufficient time to design your ad choices, get them to you for review and approval. If I design my own ad, what guidelines should I follow? Please design your ad in the exact size that the ad will be displayed in. Designs in black and white, rather than color, provide the best clarity. Your file should be submitted in PDF format. Can I make changes to my ad? Is there an additional fee for this? You can make changes to your ad at any time, FREE OF CHARGE! Please ensure that your ad information is received prior to the weekly deadline. When is the deadline for ad changes? All changes to existing ads must be submitted by 5 pm each Monday. Can I choose the space that I would like my ad to occupy? No. All ads are rotated on a weekly basis, so that everyone gets equal exposure in terms of ad location. For Further Information Or To Place An Ad, Please Contact Us Today.